If you’re looking for the best sofa bed, you came to the right place. Sofa beds are the perfect way to add a comfy bed in a small space or create a temporary guest room. There are so many different styles out there to choose from! We researched some of the best-selling items and well-known brands to put together this sofa bed review to help you find the right one for your space. First, let’s look at some of the key features. Material: These sofas are available in a few different materials. We found fabric options that resemble linen and velvet, comfy microfiber, and several different faux leather options. We’re sure there’s something that goes with just about any decor. Color: While most of these sofas are available in neutrals like black, gray, and brown, there are a few options that really have a lot of color options to choose from. There are even some bright, bold colors like red, orange, and blue. Throw Pillows: Some of these products include coordinating throw pillows that make a nice addition to the room. The items that don’t include pillows are still really comfy but the pillows are a cool added touch for any room. Type:These beds come in three different styles: pull-out, futon, and convertible. Of these, pull-outs are the ones that are most like a true bed as they involved pulling an actual frame and mattress from inside the sofa. Size: It’s important to consider the sofa’s dimensions when you shop but make sure you also consider the size after it’s been transformed into a bed. Pull-outs take up the most amount of space, futons the least. Warranty: Most of these are covered for a year but there are a few that only have warranties for 30 or 60 days. Make sure you know what your warranty covers and for how long so there are no surprises. Now that you know what to look for, let’s take a closer look at our top ten reviews. If you’re in a hurry, the best place to start is right at the beginning. We put our top and budget picks first so that you can see the range that’s available even if you’re short on time. Keep reading if you can, though. These products are all so different, you never know which one is the right one for you. Okay, ready? Let’s go! Our top pick is this modern sofa bed from Rivet, the Revolve Sofa Bed. This sofa is built with a solid wood frame and features solid beech wood legs. The clean lines and light gray tweed-like fabric have modern design features like straight lines and a clean design while still being able to work with your existing style. That’s not all, the cushions are comfortable, the fabric is durable. 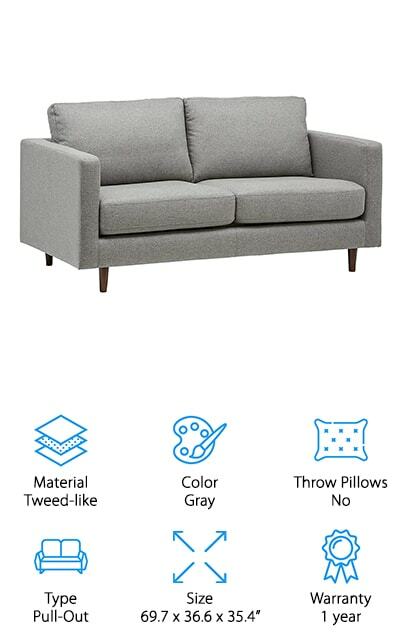 In other words, this sofa bed is a lot more than functional. This streamlined design has a simple pull-out bed that includes the mattress. It’s about the size of a full or queen size bed. Some minor assembly is required. 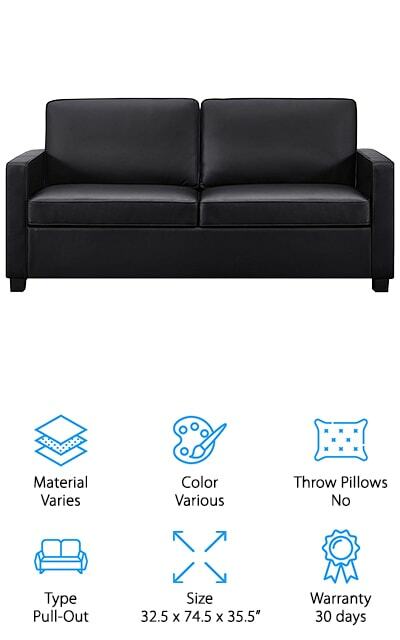 This sleeper sofa comes with free returns for 30 days as well as a 1-year warranty. 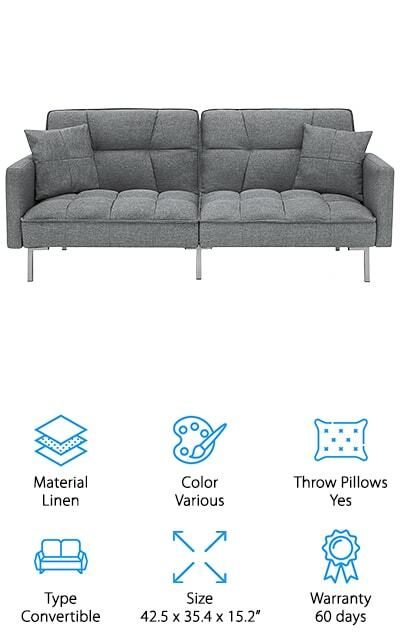 If you’re hoping to find one of the cheapest sofa beds for sale, check out our budget pick, the DHP Emily Futon Sofa Bed. This modern design features a squared cushion with a tufted design that looks crisp and clean. One of the cool things about this futon is it has a split back. You can lower one side and leave the other one up in a sitting position which comes in handy if you’re sharing this sleeping space. The material is faux leather and it’s available in a range of colors from black to blue to maroon. It’s also really easy to clean, just wipe it off and it’s ready for your next house guest. One more thing, for an added pop of style and shine, the legs are made of slanted chrome. The Signature Sleep Sleeper Sofa has a very simple modern design that looks great with any decor. It’s also super comfortable thanks to the extra wide arms and comfortable individually encased spring cushions. This sofa comes in two different upholstery styles, black faux leather and grey velvet. And get this: it comes in different sizes, too: twin, full, and queen. For a little bit of extra detail, the design has piping around the arms and seat cushions. There’s more. This is also a really comfortable pull-out sofa bed that’s fast and easy to convert from one to the other. It Includes a CertiPUR-US certified mattress made out of memory foam. With just the right amount of softness and support, it might even be better than the one you have on your bed. 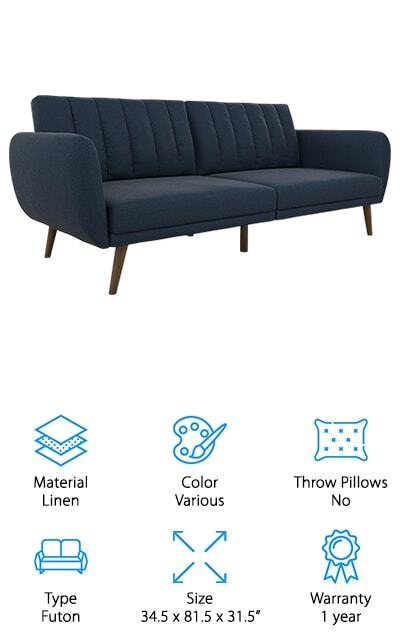 For a loveseat sofa bed with a mid-century modern, check out the Novogratz Brittany Sofa Futon. 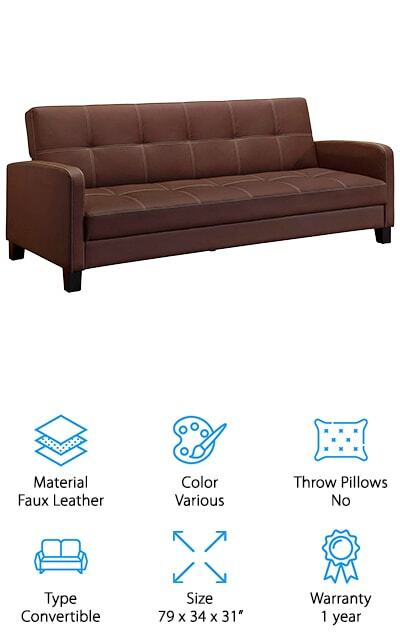 To start with, this sofa has a sturdy and durable solid wood frame and cushions filled with polyester and foam that are both comfortable and supportive. Vertical stitching adds some large tufting while the curved armrests and slanted legs add more detail to the modern look. What’s cool about this one is it looks so much like a standard, stylish couch, you might be surprised when you see it transform. The back is split into two portions and each one can lower independently. In fact, they can each adjust to about the halfway position and lay all the way flat. It’s upholstered in linen that easily wipes clean. One more thing, it’s available in six different colors. 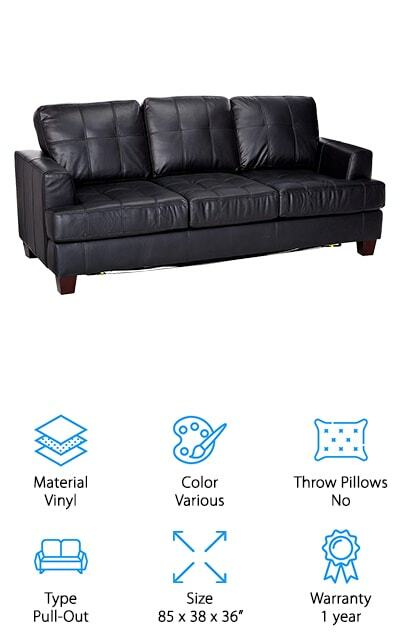 Have you been looking for a leather sofa bed? If so, the DHP Delaney Sofa Sleeper is a beautiful design that you should take a closer look at. The faux leather upholstery looks rich and feels soft. That’s not all, it’s also really easy to maintain. All you have to do is wipe it clean with a damp cloth. It’s available in two different colors, black and brown. Each has the same white accent stitching that helps create large tufts across the back and along the seat cushion, adding little details that really make a difference. The frame is made of wood that will last a long while. Converting it from couch to bed is really easy, too. Just lower the back of this convertible design and you’re ready for bedtime. 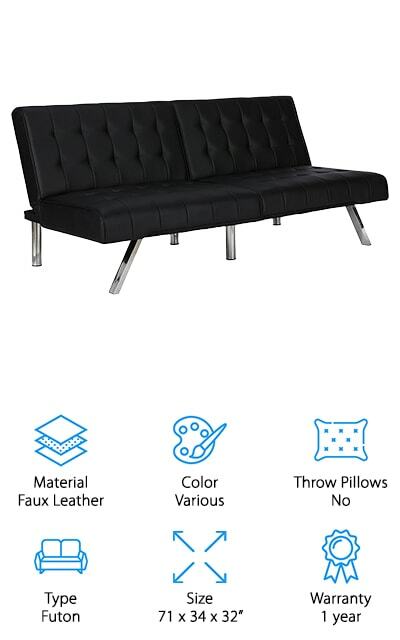 The Best Choice Convertible Futon just looks like a fun piece of furniture. The plush cushions look welcoming, soft, and pillow-like. There’s also a split back so you can lower you half if you want to and someone else isn’t quite ready for bed yet. The filling is firm, comfortable, and even hypoallergenic. 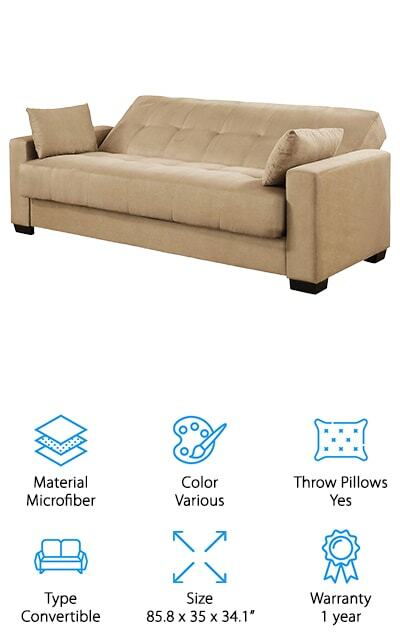 That’s not all, this futon even comes with matching throw pillows that make your sleep even more comfortable. As far as style goes, the chrome colored legs add a pop of shine that looks great against the fabric. Plus, this futon comes in eight different colors. They range from muted neutrals like gray and cream to bright, bold colors like orange and blue. You're sure to find one that will work well with your decor. Up next is the Coaster Samuel Sleeper Sofa. This one has a pretty simple design that’s upholstered in bonded vinyl for more durability. The cushions are removable but have Velcro strips to help keep them in place. They’re firm and offer a lot of support without affecting their comfort level. As for the pull-out bed, getting it set up is pretty easy. The included mattress provides a good amount of comfort and support for you or your houseguests. 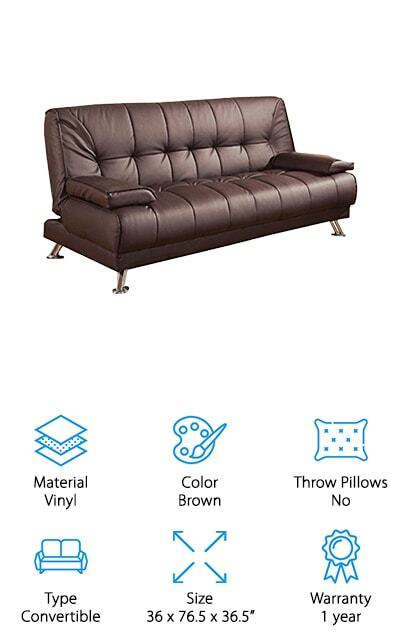 That’s not all, this sofa is available in three different neutral colors: black, white, and brown. This sofa should be able to integrate easily into any style of home decor. There is some minor assembly required as you have to screw on the feet. Other than that, you’re good to go! What we love most about the Pearington Mia Sofa Sleeper is that this convertible sofa bed also has room for storage. The back of this sofa adjusts into three different positions: sitting, lounging, and sleeping. The bottom cushion lifts up to reveal additional storage space, the perfect place to keep extra pillows and blankets for guests using this sofa bed during their visit. This sofa is supported by a natural hardwood frame that’s strong and long lasting. The cushions are filled with a mix of rich foam and plush polyester fill which means they’re both comfortable and supportive. There’s more, the upholstery is soft, durable microfiber that’s easy to clean. It’s available in three different colors: khaki, grey, and mocha and each color comes with two matching pillows. 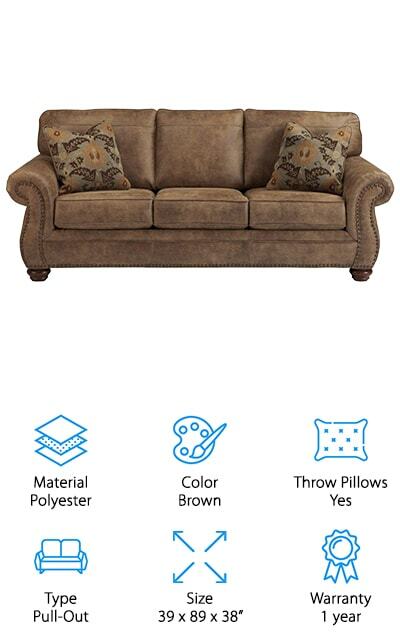 This beautiful Ashley Furniture Sleeper Sofa is next in our reviews. The rounded arms and curved base give this sofa a classic design that’s a great fit for medium-sized spaces. It’s upholstered in polyester that looks just like weathered leather and there are there are antiqued gold nailhead accents around the arms and along the bottom of the sofa. Large round wooden feet peek out from the bottom, adding an interesting detail and really anchoring the look. The high-resiliency foam seat cushions are firm and comfortable plus it has bustle backs for lumbar support. That’s not all. It comes with a bi-fold queen-size mattress and you can choose whether you want innerspring or foam. Setting up the bed is easy, just pull it out of the base and set up the simple steel frame. Last up is the Coaster Casual Sofa Bed. This is a simple convertible design that’s easy to switch from sofa to bed and back again. The back cushion lowers flat and provides a nice size sleeping surface. It’s upholstered in brown vinyl. Both the backrest and the seat cushions feature large button tufted sections for added support and comfort. The armrests on this couch are interesting, too. Why do we say that? Because they’re removable. That means you can take them off and really sprawl out if you want to. They attach to the bottom portion of the seat with simple Velcro strips. The legs have a chrome finish that really stands out against the brown material. They’re angled to add a little bit of visual interest.